What is the X factor in tennis? What can you improve to give you that extra edge over your competitors and be the difference-maker to vault your game to the next level? 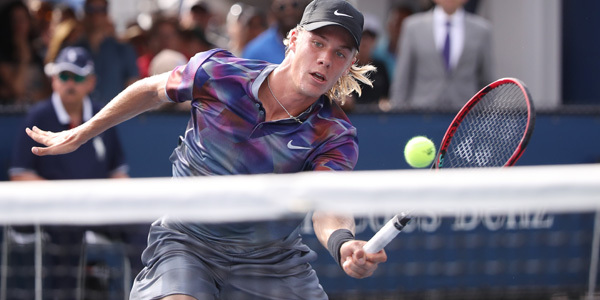 Shapovalov reached a career-high ATP singles ranking of No. 51 on September 11, 2017 after being ranked 143rd in early August. Shapovalov’s play on the Tour has been remarkable despite turning pro only a year ago. Shapovalov’s stellar 2017 season includes: beating No. 2 Rafael Nadal at the Rogers Cup (becoming the youngest player ever to reach an ATP World Tour Masters 1000 semifinal), reaching the fourth round at the US Open and making it to the semifinals at the Canadian Open. Shapovalov stated that confidence is the X factor that is the reason for his elite play this season. There may be some objection in your mind about confidence being the difference-maker. You might think talent, training, coaching or physical ability is the most critical component for elite play. While these components are absolutely necessary to reach the pinnacle of your sport, without confidence, the impact of these contributors is greatly lessened. You can probably call to mind many talented players that consistently fail to live up to their potential. Confidence allows you to explore your potential. When you are confident, you see mistakes as learning opportunities that can help push you to greater heights. Confidence gives you the motivation to work hard in practice and learn new skills. When you are confident, you believe your actions matter. When confidence is low, you take criticism to heart and lose even more confidence. Confidence helps you see criticism from your coach as constructive advice rather than condemning your ability. Confidence gives you the belief that you are capable of accomplishing your goals but also that you can further develop your abilities in order to achieve even more in the future. As y0u see, without confidence, peak performance is impossible. The great news is that confidence is not a genetic trait but a mental skill that grows with daily attention. Make the commitment today to develop your confidence. Confidence requires effort. It’s easy to remember what when wrong. Get into the habit of thinking what went right! Start a confidence log. Each morning when you wake up, write down three strengths and each night before you go to bed, write down three successes. Small ones count! Build daily confidence by seeing your strengths and successes as opportunities to grow your mental game. Identify mistakes you may be making in your pregame mental preparation. Download our Free Pregame Mental Preparation Tips!